" It’s your story – don’t lose it " is the theme of this year's celebration of the World Day for Audiovisual Heritage (27 October). UNESCO encourages audiovisual archives around the globe to join us in celebrating 27 October by showcasing their precious collections and holdings as part of an international endeavour to promote the value of audiovisual heritage. Audiovisual archives tell us stories about people’s lives and cultures from all over the world. They represent a priceless heritage which is an affirmation of our collective memory and a valuable source of knowledge since they reflect the cultural, social and linguistic diversity of our communities. They help us grow and comprehend the world we all share. Conserving this heritage and ensuring it remains accessible to the public and future generations is a vital goal for all memory institutions as well as the public at large. The World Day for Audiovisual Heritage is a commemoration of the adoption, in 1980 by the 21st General Conference, of the Recommendation for the Safeguarding and Preservation of Moving Images. The World Day provides an occasion to raise general awareness of the need to take urgent measures and to acknowledge the importance of audiovisual documents. 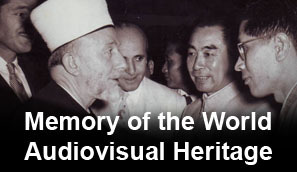 Public Exhibition "Memory of the World: Documentary Heritage in Asia and the Pacific"
Winter School for audiovisual archiving "Sound and Archive"